Here’s the comfiest and best ottoman coffee table around. So you’ve decided that an ottoman coffee table will suit your needs? Great! 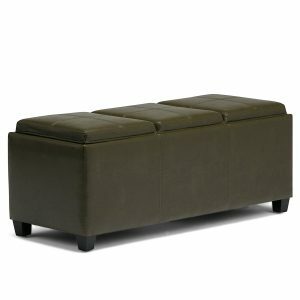 I always liked ottomans due to their doubling as storage space and seating. Now the question remains which one? A narrow leather one? A large square one? Let me help you with that. I’d like to mention that over the years I’ve bought mainly the smaller narrow ottomans to act as a sort of extra “compartment” in my living room. I too have owned the very large ottomans and let me tell you these are great to kick your feet up on and enjoy a movie on a cold winter day. spoiler Alert – check out the best ottoman coffee table here! For those of you wondering yes they can still act as a table to set drinks and food down on as most ottomans seat tops flip over to act as trays. No worries this is a table that has multiple forms! I hope you’ll find what I have to say about these informative and helpful in deciding which is best for you. As always these are what I believe are the best around. The “original” ottoman coffee table. You really can’t go wrong with this one. 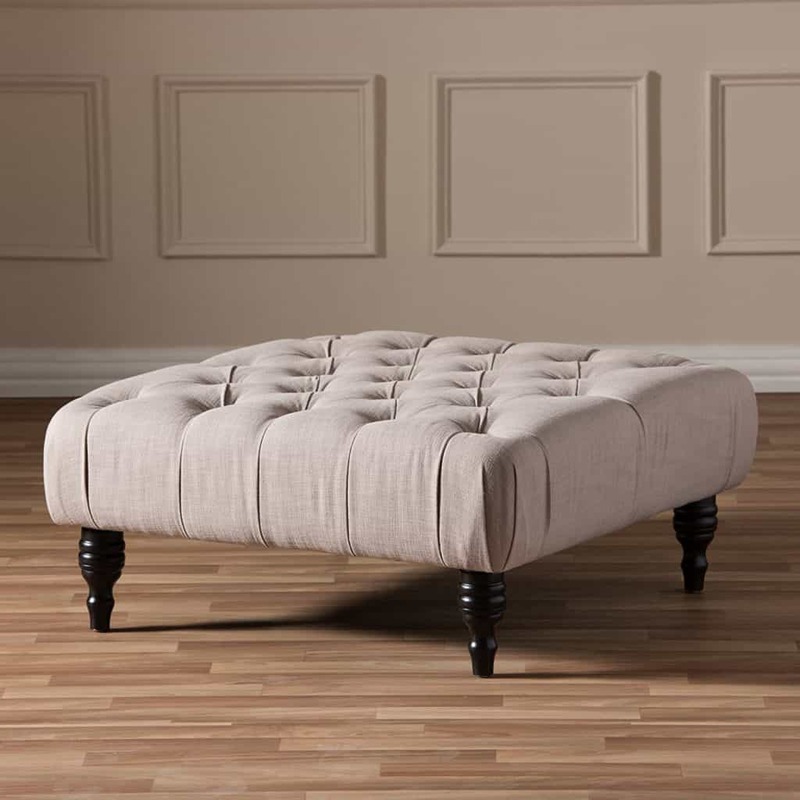 You can’t get any more classic when it comes to ottoman coffee tables the Simpli Home Avalon Coffee table storage ottoman is the perfect choice for those who have a more “enclosed” living room. This table features 4 tops that act as serving trays when flipped over. The one featured in the photo above is a brown color but they come in many different colors which you can see for yourself here. The table also comes in your choice of PU leather or Fabric. The PU leather however has that glossy look which makes it easy to clean and also protects it from spills. This ottoman is 35 in. squared which is an excellent size and also acts as a great place to store items. Easy assembly and overall excellent ottoman. A sleek and non intrusive table. Doubles as a storage trunk. A personal favorite of mine. Have you ever seen an ottoman feature bent wood trays like that? Neither have I. Certainly a positive considering the creativity! Now this is a cool little “stubby” kind of coffee table. Don’t let that fool you though this thing is the right mix between a large square table and a narrow one. It’s both sturdy and “roomy” enough to store all of your stuff. It has a height of 17.5 in. a width of 19.5 in and a length of 34.75 in. so it’s a good compromise between the larger and smaller ones. The unique thing about this table is that it features bent wood trays that you can actually flip over to act as trays. It’s convenient because it gives you a wooden table top appearance if you want and trays as well. The choice is yours! This one comes in espresso faux leather so maintenance is a breeze. The table also comes assembled so all you have to do is unbox and enjoy! A leather ottoman coffee table? I say “Why Not!”. This one is quite similar to our first table except it’s 31 in. Perfect for a smaller living room. It features two longer serving trays as you can see in the photo. This ottoman coffee table overall feels a bit more robust and sturdy than our first example. Having sat on both, this one appears like it can support more weight. This is most likely due to its stable wooden frame. 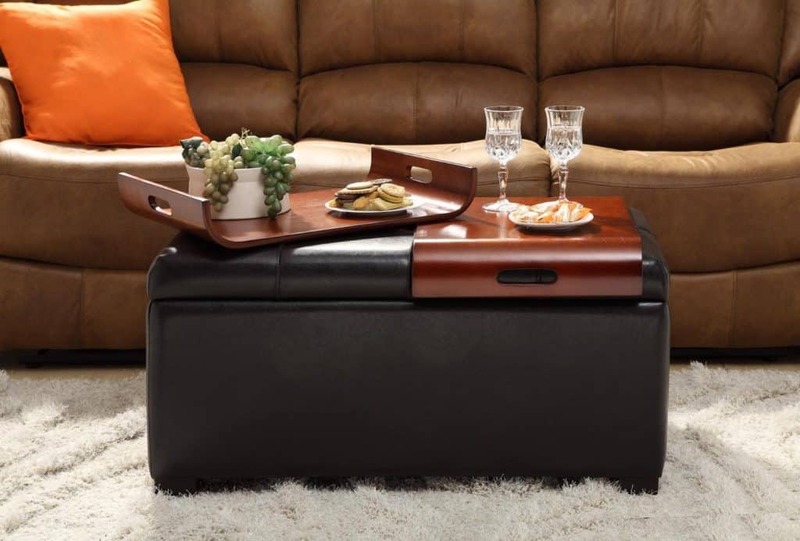 All around a very nice multipurpose ottoman coffee table. I’m sure many will be satisfied with it. Ever feel like just having a “lazy day”? Hard to do that without this beauty. Note this one does not have any table tops that can double as serving trays or storage! With that aside let me say I don’t miss the trays too much. This table just looks great in my living room. It’s the perfect table for those who want to just relax and kick their feet up on after a long day of work. It’s button tufting and wood frame make it both sturdy and classy. I’m sure anyone would be happy with this kind of setup. Don’t let the fact that it doesn’t feature any trays dissuade you as you can always buy separate trays later. It’s not too heavy and comes in at 35 in. squared so perfect for almost any living room. The height on this table is a little low at 15.5 in. so keep in mind exactly what it is you want out of an ottoman coffee table. Leather, wood frame , and storage space!? It doesn’t get any better than that! This ottoman much like our last doesn’t feature any serving tray’s. It does have a bottom shelf for storage though. It’s kind of a mix between your traditional coffee table and an ottoman. The bottom shelf features a beautiful slat design pattern that’s perpendicular to each other. 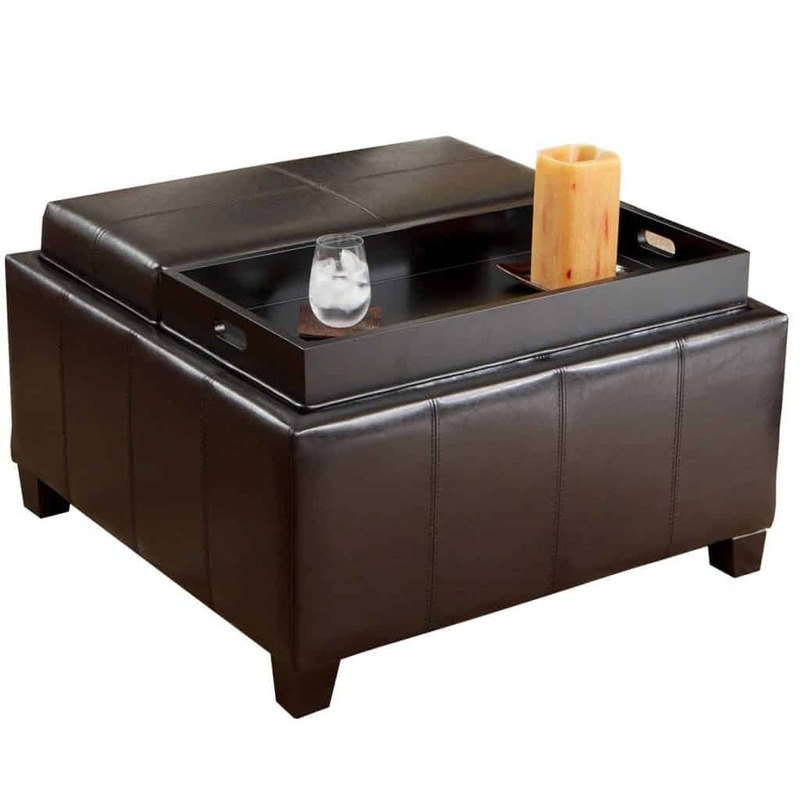 The top is covered in faux leather and is sturdy enough to place items on just be careful with those drinks. The dimensions on this table are 48 x 30 x 19.5 inches so it’s a pretty large piece. It’s also quite heavy weighing about 61.6 pounds so make sure you have some help when loading this into your home. This table will require some assembly but as I recall it was quite simple as are most coffee tables. A few final words on the ottoman coffee table. Alright so I hope you now have a much better idea of what type of ottoman coffee table or leather ottoman coffee table you want. Again these are what I consider to be the best out there. If you come across any you think I should know about feel free to message me. Now if you still can’t make up your mind then allow me to recommend to you my personal favorite out of the bunch. 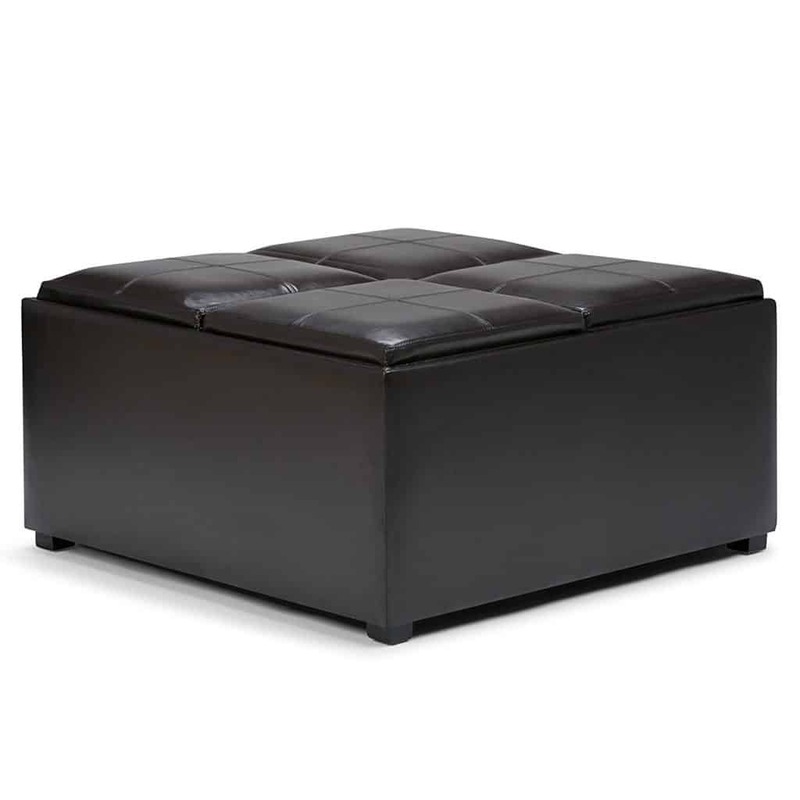 The Simpli Home Avalon Faux Leather Rectangular Storage Ottoman with 3 Serving Trays. This one really stood out for me. Out of all the ones I’ve had the pleasure of using over the years, this is my favorite. The reason lies in part due to its narrow and simple design. If you know me than you know that I believe the simple things in life are the best. It’s just the right size and allows enough passageway between your sofa. Not to mention it’s easy to move around due to its light weight so it can act as additional seating space as needed. Trust me that came in handy over the years especially during the holidays. The trays are also super handy and help keep any mess you may make an easy clean up due to the way it contains any spills within the walls of the lid. You can’t go wrong with this one! And really they’re all great so don’t hesitate to check out the others as well. As always I’m available if you any questions. Previous Previous post: What’s the best rustic coffee table? I found it! Next Next post: Which is the best acrylic coffee table? Take a look here! Hi there! Thank you for stopping by. My name is Enrique and I'm a software developer who likes to review products in his spare time. I created this site to share my personal experiences with various home decor pieces and hopefully help you choose the best style for your own home. My goal is to carefully compare various products to help you pinpoint which suits you best. I think I’ve found the perfect trunk coffee table. My Favorite Wrought Iron Coffee Table. Which is the best acrylic coffee table? Take a look here! What’s the best rustic coffee table? I found it!